DotComSecrets Local offers Internet marketing services and consulting for local businesses in Dublin and elsewhere in Ireland. The range of our services include the following: Web Design, Website Audit, SEO, Local Buzz, Social Media, Email and Text Message Autoresponders, Facebook Fan Page Design, Pay-Per-Click Advertising and Online Reputation Management. Please visit at our website for further information. 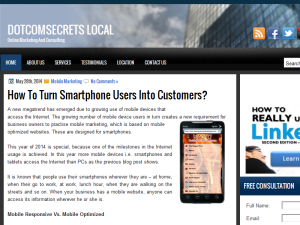 This what your DotComSecrets Local - Internet Marketing Services and Consulting Blog Ad will look like to visitors! Of course you will want to use keywords and ad targeting to get the most out of your ad campaign! So purchase an ad space today before there all gone! If you are the owner of DotComSecrets Local - Internet Marketing Services and Consulting, or someone who enjoys this blog why not upgrade it to a Featured Listing or Permanent Listing?